If you are seeking a state-approved traffic school, look no further. At Lowest Price Traffic School, our online courses are approved in all 67 Florida counties. You can rest assured that the program you enroll in will satisfy the needs of the state and the courts. Whether you opt for our 4-hour Basic Driver Improvement course or another program, you can be guaranteed that it will meet your needs. Enroll today! Here's a question we get sometimes: "Are you approved by the State of Florida?" 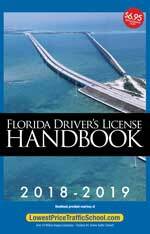 Yes, the courses we offer are approved in ALL 67 Florida counties by the Florida Department of Highway Safety & Motor Vehicles (Florida DHSMV or HSMV). 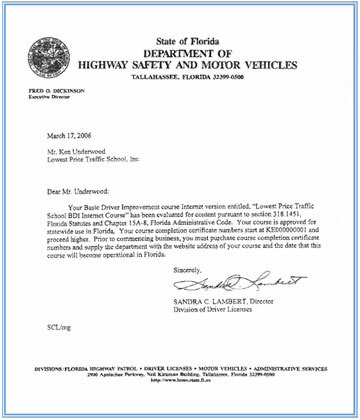 While there are hundreds of Florida Traffic Schools Online, we are actually one of the few certified course providers. Not only are we a DMV approved traffic school provider, we are also the ONLY Florida Traffic School approved by the National Safety Commission...one of the most recognized names in safety in America! 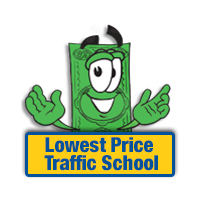 From Pensacola to Key West, Miami to Jacksonville, and Tampa to Ft. Lauderdale, 3 million happy customers agree that Lowest Price Traffic School is the place to go for DMV approved traffic school training and no points! Below is the DMV approval certificate issued by the State of Florida. This is the 4 Hour Judge Ordered Online Traffic School and the DMV Ordered TCAC (Traffic Collision Avoidance Course). If you were ordered by a Florida court or judge, or even the Florida DMV, to take a 4-hour driver improvement or defensive driving course then this traffic school course is for you.